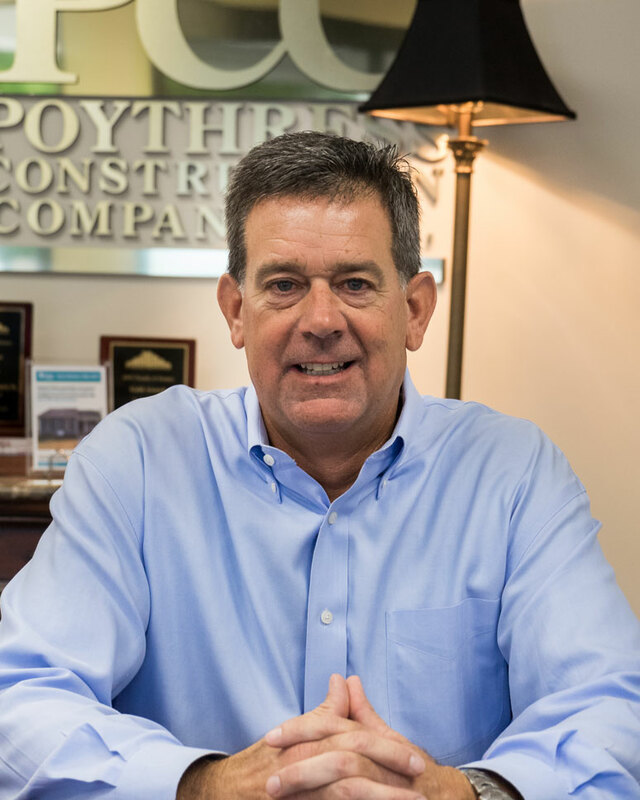 About US | Poythress Construction Company Inc.
Kevin Poythress, owner of Poythress Construction Company, Inc., is a Cary native with over 35 years of experience in residential and commercial construction. Kevin has built homes throughout the Apex, Raleigh, Fuquay Varina, and Chapel Hill areas for over 25 years. Averaging 20 homes built per year, Kevin typically builds properties that range in price from $400,000 to over $1 million. Kevin earned a B.S. in Civil Engineering and M.S. in Structural Engineering from North Carolina State University, and is a licensed Professional Engineer in the state of North Carolina. His depth of knowledge, construction experience, and hands-on approach to homebuilding continues to serve Raleigh-area homeowners through PCC every day. Buying a new home may be the most important investment you will ever make—it is because of this that Kevin Poythress and his team keep customer needs and desires at the forefront of every design and construction task. 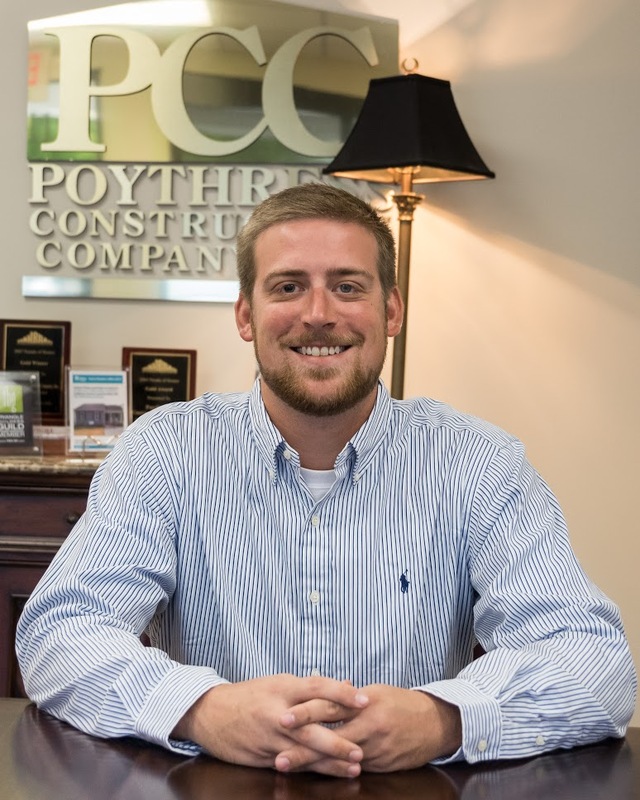 Nolan Poythress, Project Manager at Poythress Construction Company, Inc., is a Cary native and graduate of North Carolina State University with a degree in Business Management with a concentration in finance. Growing up in a family of homebuilders, Nolan developed a keen understanding of residential construction through many years of hands-on experience, beginning at an early age. Upon earning his degree, he moved into banking and finance where he developed an appreciation of the relationship between finance and home-building. He then decided to return to his custom home building roots. After acquiring his financial experience in the banking sector, he transitioned to his current position as a Project Manager with PCC where he has been serving customers throughout central North Carolina for the past three years. Nolan is an essential component of PCC’s mission to deliver extraordinary, custom homes that exceed client expectations. project management, satisfied customers, specialized skills, and a passion for building quality custom homes. This group leverages its purchasing power to secure the lowest labor and material prices for your new custom home purchase. This exclusive group not only builds beautiful homes with the highest standards of workmanship and materials – they demonstrate their commitment to the quality of life in this area by giving back to the community through community service, charitable activities, and donations. Poythress Construction Company, Inc. opened its doors in Raleigh in 1993 with a focus on providing beautiful, single-family, custom homes for residents in Cary, Holly Springs, Fuquay Varina and surrounding areas. PCC homes are completely customizable to the owner’s needs and can be built on lots of any size. Recognized as a top Raleigh-area home builder in Triangle Business Journal. “Best of the Best” by -Orange County Home Builders Association - 1998 & 1999. Every Raleigh area home built by Poythress Construction Company is backed by a one-year builder warranty and six-year warranty provided by the Residential Warranty Corporation. PCC is intent on creating magnificent homes and lasting relationships with their owners; we will earn your confidence by making the building experience as enjoyable as possible. If you experience any issues with your home during the warranty period, our team will be happy to conduct an inspection and perform necessary repairs. We encourage you to see what some of our past clients have to say about their experience, both during construction and after moving into their new, custom home. To learn more about Poythress Construction Company, Inc., or to see how we can make your dream of owning a new home home a reality, get in touch with us today! You can complete a short contact form. Poythress Construction Company, Inc. is a premier custom home builder in Apex, NC. We have been constructing beautiful, custom homes for clients throughout Raleigh, Cary, Holly Springs, and Fuquay Varina area since 1993.